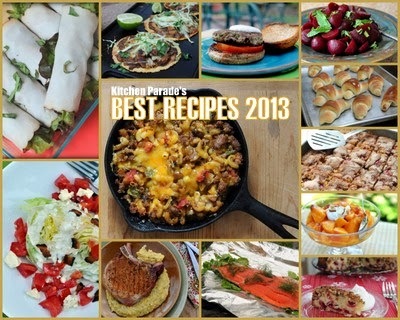 Favorite recipes from 2013, yours and mine both, just one "best" recipe per month. Looking back, does it strike you as it does me that my recipes are becoming simpler, more family-friendly – still real food and still healthy, flavor-forward and seasonal of course, those are the touchstones of my food sensibility, after all – but also more ready for preparation on a whim? Is your food sensibility evolving too? What was new in 2013, what do you look forward to in 2014? First, your favorite recipes! Each one is pictured in the collage above. Starting in the center, Kitchen Parade's top recipe for 2013, homey comfort food, a simple Hamburger Casserole. You couldn't get enough of this! Now, clockwise from the upper lefthand corner. First, Easy Skinny Turkey Roll-ups with Fresh Veggies, these are such an easy lunch, they keep and are great to carry along. Next, my own obsession for a few weeks, so easy to put together on a whim, just tortillas topped with "stuff", it's the technique that matters when making Mexican Pizza (Oaxaca Tlayuda). See what I mean about family-friendly, easy recipes? During summer, there's nothing like turkey burgers kept moist and light with grated zucchini, try these Jerusalem Turkey Burgers with Zucchini. Now starting in the upper righthand corner. Mostly, I opt for fresh vegetables, fresh beets too, but for Refrigerator Pickled Beets, canned beets can't be, ahem, beat. When some things are so easy to make, there's time to make recipes like Homemade Butterhorns (Thanksgiving Crescent Rolls), my grandmother's recipe. And a rustic Rhubarb Cake! And Peach-Pie Pudding, it's a peach pie without the crust and oh-so-summer-good. For winter? Make a Fresh Cranberry Cake, another rustic cake, this one is best made a day or so ahead of time. Continuing clockwise along the bottom row, your favorite summer recipes were a Simple Grilled Salmon, Perfect Thick Pork Chops and a Wedge Salad with Homemade Low-Cal & Low-Carb Blue Cheese Salad Dressing. Take a second look? We share many of the same favorite recipes from 2013 but honestly, I think that readers missed some good ones. I hope you'll take a second look at these, they're ones I make again and again, solid basics, nothing fancy, just good food prepared well. Without further ado, enjoy! Pinterest For easy re-pinning, I've pinned these Kitchen Parade's best recipes of 2013 on a special board on Pinterest. A Veggie Venture's best vegetable recipes of 2013 are pinned too but if you'd like the source, here are Best Vegetable Recipes of 2013 from A Veggie Venture. Thanks for this round up--especially for reminding me of the fresh cranberry cake. That's one of the reasons I've been buying cranberries while they are available and popping them into the freezer.